Daisen G Bock is a 6.5% bock beer from Kumezakura Brewery, based in Tottori, Japan. It’s part of their autumn seasonal lineup and is usually on sale towards the end of the season. Daisen G Bock was first released in 2015 as part of a limited run for an event Kumezakura Brewery did, but then proved to be so popular that it made its return in 2016 and will continue to do so each autumn from now on. Daisen G Bock poured out a deep brown colour with a certain amount of haze in there, along with a off-white head which lent towards the tan side of colours. The head was frothy to begin with but subsided quickly to bubble around the outside, leaving a slight oily slick on top. There was no sign of any sediment in the glass or in the bottle either. Daisen G Bock had a large roasted malt aroma with caramel and chocolate coming through, with a hint of smokiness too to follow. A slight Belgian phenolic yeast edge was also present when the beer had warmed up somewhat, though it wasn’t overpowering or off-putting. Daisen G Bock is smooth – no doubt about it – and though it did get a bit prickly when it had warmed up, the flavours were well balanced. It started off with a smokey coffee edge with caramel coming to the forefront as well. 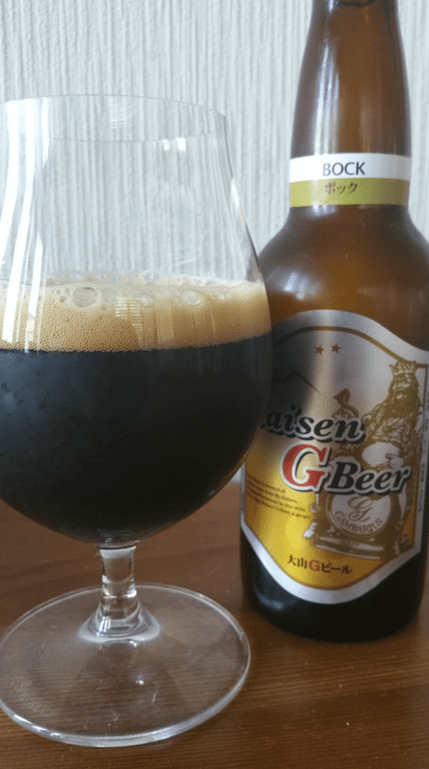 For a large flavoured beer, Daisen G Bock didn’t become cloying nor was it too sweet – though the only negative thing I could say about it is that the body needed to be thicker and bolder. It finished off with a lingering burnt toffee edge and would be great as a dessert beer with something sweet. I liked Daisen G Bock but it isn’t a great representation of what a bock. Still, worth trying if you come across it.